Once winter has already arrived, the gastronomic temptations come too. For those who are living or traveling in São Paulo, the best option is the big variety range of soups and fondues found on the best restaurants in town. However, this season brings some novelties to the menu, that goes further the onion cream or cheese fondue. Specializes in Mediterranean cuisine, the restaurant Torero Valese, in Itaim, created unusual dishes such as pumpkin soup with mussels and seafood. It's possible to choose up to three flavors (about R$ 49,90). Most in a brazilian mood, the restaurant Bolinha made a real trip through the typical flavors of the country adding exotic dishes to the menu, such as pumpkin soup with cream, cinnamon and orange crust, pumpkin soup with ginger and peach palm soup (whole buffet for R$ 24). The charming Le Vin Bistro offers a mix of Brazilian spices with a French palate. 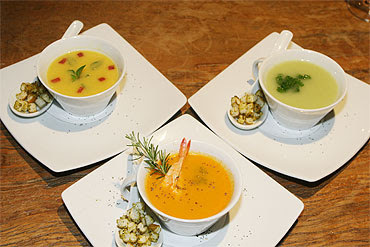 The features are pumpkin soup with shrimp and cashew nuts; and soup of white asparagus (each for $ 24). Originally a traditional Swiss made by cheese, the tasty "fondue" got a new version. Le Bistrot Marcel has among its options, the fondue au crevettes with shrimp and seven sauces (R$ 75). At Era uma Vez um Chalezinho, fondues are the highlights, made with ingredients from famous brands such as Éder, which brings cheddar with beer and Éder's sausages (R$ 98).